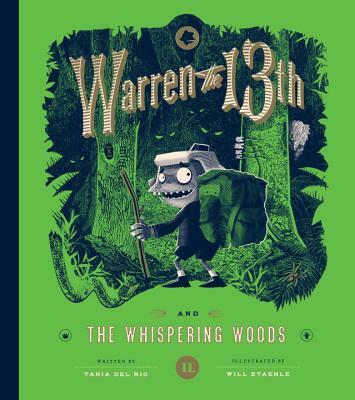 In the spirit of Edward Gorey and Tim Burton, this fast-paced and beautifully-designed sequel to Warren the 13th and the All-Seeing Eye is packed with nonstop action, adventure, and mystery for middle-grade readers. Twelve-year-old Warren has learned that his beloved hotel can walk, and now it’s ferrying guests around the countryside, transporting tourists to strange and foreign destinations. But when an unexpected detour brings everyone into the dark and sinister Malwoods, Warren finds himself separated from his hotel and his friends—and racing after them on foot through a forest teeming with witches, snakes, talking trees, and mind-boggling riddles, all accompanied by stunning illustrations and gorgeous design from Will Staehle on every page. Tania del Rio is the author of Warren the 13th and the All-Seeing Eye (Quirk, 2015). A professional comic book writer and artist, her clients include Archie Comics, Dark Horse, and Marvel. She is best known for her work writing and drawing the 42-issue run of Sabrina the Teenage Witch. She lives in Los Angeles. Will Staehle illustrated and designed Warren the 13th and the All-Seeing Eye, plus many dozens of award-winning book jackets. Print magazine named him one of the Top Twenty under Thirty New Visual Artists. He lives in Portland, Oregon.